Stena Line is in the process of launching the smartest chatbot into the ferry market. Stina will help make the customer experience even better by providing assistance in booking a trip as well as answering questions 24/7. The chatbot is an important milestone for Stena Line in its quest to becoming the world’s first cognitive ferry company. Stina can give Stena Line’s customers updates regarding information on departure times, prices and can answer the most frequently asked questions 24/7. For example, if customers are allowed to bring pets on board, how to change a booking and what time they need to check in. What makes Stina unique is that she can help Stena Line’s customers to book a trip as well as keeps track of potential delays. “When chatting with Stina she will help you find where and when you would like to travel, and then she funnels you into our web-based booking system to finalise the booking. This is a unique service in the ferry market and just one key feature that makes Stina smarter than others, along with her ability to keep track of delays in real time,” says Anders Hellberg, Head of Customer Acquisition & Conversion at Stena Line. As Stina is still evolving, Stena Line has initially launched her into the UK market. At the moment all customers visiting the “Need help” section of stenaline.co.uk or using the Stena Line TravelMate app are greeted by English speaking Stina. Once Stena Line is satisfied with Stina’s performance, she will be introduced to other markets and become multilingual. “Our goal is to have her speaking the native language for all of our regions, and next up is Swedish and German. We are also looking at voice command to see if would be possible for our customers to speak to Stina as you would talk to Siri or Google. Last but not least, we are working hard to have Stina support our customers through the whole booking process, from start to payment," says Anders Hellberg, Head of Customer Acquisition & Conversion at Stena Line. How did Stina get so smart? Besides a solid technical platform based on IBM Watson, detailed information collected from the company’s contact centres also plays a key role. When the basic knowledge was in place, artificial intelligence came into play. For each question answered, Stina asks if the answer was okay or not. Based on that information, she automatically trains herself, without any human involvement. 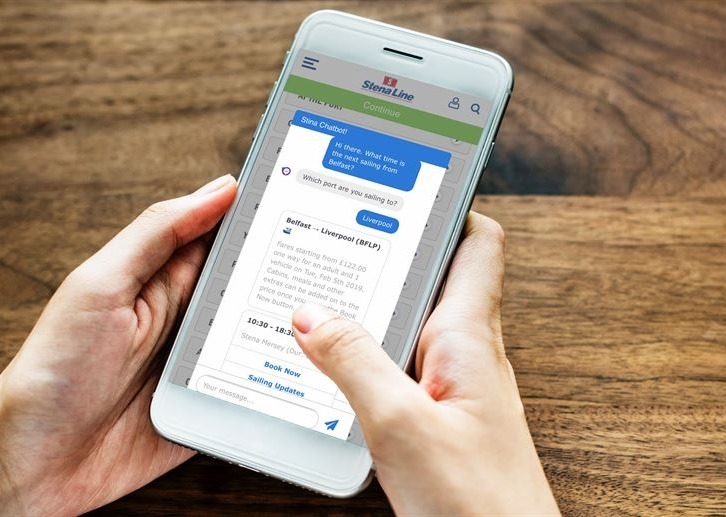 “This is one of many great examples of how we are using artificial intelligence to increase our efficiency and improve the customer experience. With Stina we are taking another step towards becoming the world’s first cognitive ferry company, says Jari Virtanen, Chief Transformation Officer at Stena Line. Do you want to chat with Stina? Please visit https://www.stenaline.co.uk/faqs.